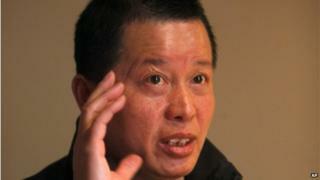 Leading Chinese dissident, Gao Zhisheng, has been "utterly destroyed" after three years in jail, says his international lawyer, Jared Gensher. Mr Gao - who was released from prison last week - was emotionless, "basically unintelligible" and had lost teeth through malnutrition, Mr Gensher said. As a prominent human rights lawyer, Mr Gao had defended China's Christians and followers of the Falun Gong movement. He is alleged to have suffered physical and psychological abuse in jail. As well as losing many teeth, Mr Gao's daily ration of cabbage and a single slice of bread had caused him to lose 20 kg in weight, according to a statement by US-based advocacy group, Freedom Now. The group said he had been confined to a cramped cell, with very little light, and had been largely deprived of human contact until his release. Freedom Now said Mr Gao's wife, Geng He, had spoken to her husband and was "completely devastated" by what the Chinese government had done to him. "The only thing I feared more than him being killed was his suffering relentless and horrific torture and being kept alive," she is quoted as saying. Ms He has urged the Chinese government to allow Mr Gao to seek treatment in the United States, where she and their two children have been living since 2009. Mr Gensher said Mr Gao had been "in an incredibly bad way". "He is able to say a few words here and there and answering questions in a few words, describing what he went through," he said. "But he's not capable of holding any conversation and there are many occasions where he's just literally just muttering to himself." Mr Gao, 50, has been an outspoken critic of the Chinese government, and has defended activists and religious minorities in the past. He was nominated for the Nobel Peace Prize in 2008 for his work. He is known for campaigning for religious freedom, particularly for members of the banned group Falun Gong. He was arrested in early 2009 and accused of inciting subversion. Mr Gao was released briefly in 2010, and claimed he had been tortured in detention. Shortly after that he disappeared again. State media subsequently said in 2011 that he would be jailed for three years for violating probation rules. He was released from a prison in the western province of Xinjiang last week. The US, European Union and United Nations had repeatedly called on the Chinese authorities to release him.